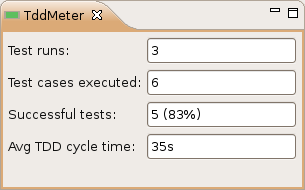 In literature the time for one TDD cycle is stated to be about a couple of minutes. I was wondering how my personal cycle time is at an average. So I wrote a little plug-in for Eclipse that listens to test runs and computes the average time between a test run with failures and a test run without any failures. In case you want to give it a try you can download it here. The plug-in contributes a view called TddMeter. In order to show it simply hit <CTRL>-<3> and type TddMeter. Update: The plug-in now persists its state. Thanks for your feedback. The plug-in now persists its state.